CONCORD — Northern Pass wants the state Department of Transportation to approve and monitor project construction on local roads where the proposed high-voltage transmission line would be buried or other work. But the department said in a letter dated Dec. 22, it does not believe it should be approving, monitoring construction compliance or making decisions with long-term consequences for local roads. Department of Transportation Assistant Commissioner William Cass says the department intends to hire a private firm at Northern Pass’s expense to monitor permit compliance and construction agreements along state roads because it does not have the staff. “The Department does not have the resources to monitor the work on municipally maintained local roads which would require knowledge of local ordinances and municipal operations which the Department does not have,” Cass said. Project Developer Eversource asked the Site Evaluation Committee, which decides if the project is permitted, to delegate authority to the DOT to approve construction, curb cuts and driveway permits, detour routes and traffic management plans for local roads. Project officials have said giving the state agency the authority would provide consistency rather than a hodgepodge of local ordinances and regulations that could further delay the $1.6 billion, 1,090-megawatt transmission line to transport Hydro-Quebec electricity to the New England grid. The request is opposed by local officials in testimony before the SEC including Concord, Plymouth, Franconia, Whitefield and Sugar Hill. Project officials say they have not yet decided how to respond to the letter. The company has sought memorandums of agreement for construction works with communities along the route, but to date few have been finalized. In this letter, Cass said the agency does not have authority to approve detours over local roads and does not want to set the precedent or change its long-standing policy. Likewise, he said the agency’s policy is to not use local roads for traffic control unless approved by the local community. Cass also said the department will only approve permits required for access to state maintained roads, but not local roads as the agency does not have the authority or resources. The developer also asked the agency about the status of its exception requests to bury the line and splice vaults under the pavement of state roads. The state halted action on the requests this fall saying additional survey work is needed to establish the boundaries of the state right-of-way where the line is to be buried. In its letter Cass said the agency would approve the requests once the developer satisfies all of the department’s concern, noting it does not have the authority to grant requests for local roads. The agency does not have the funding or staff to take on the additional work without delaying its normal duties and could impact the state’s transportation improvement plan work, he said, and noted there is concern highway funds could be used for non-highway projects if the agency’s responsibilities are extended. “The NHDOT requests that the SEC pursue other options for delegating that authority,” Cass said. The chair of the SEC denied five motions in the case ranging from a request for a new application to one asking for confidential treatment for data on alternative routes studied for the project. The Grafton County Commissioners, joined by a number of other intervenors, asked for the process to essentially begin again saying the project has changed substantially since public hearings were held. But chairman Martin Honigberg notes the applicant has continually updated its plans and there have been ample opportunities to address those changes throughout the adjudicative hearing process. Honigberg also rejected a motion for a protective order and confidential treatment for business and pricing information related to alternative routes for the transmission line. Also denied was a motion from three environmental intervenors seeking a declaratory ruling that only hydro-generated electricity could flow over the transmission lines. And Honigberg rejected two requests for rehearings on earlier denials challenging rulings from the bench and to disclose all of Northern Pass’s bid information for the Massachusetts clean energy project. The Massachusetts winning bid will be announced at the end of January. Adjudicative hearings on Northern Pass ended Dec. 22 and SEC deliberations begin Jan. 30 and continue in February. The committee must make a decision by the end of February. 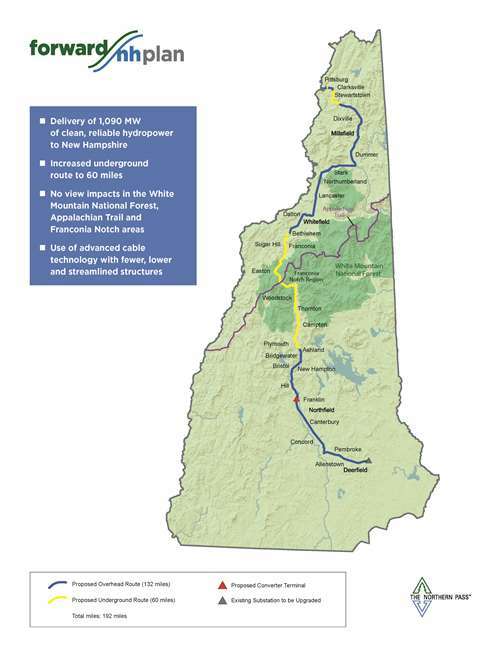 If approved, Northern Pass officials say they will begin construction in the spring and the line will be finished by 2020.